"A young Nigerian living in New York City goes home to Lagos for a short visit, finding a city both familiar and strange. Along the way, the man reconnects with old friends, a former girlfriend, and extended family, taps into the energies of Lagos life—creative, malevolent, ambiguous—and slowly begins to reconcile the profound changes that have taken place in his country and the truth about himself. "— Random House. Teju Cole is my favorite contemporary writer. I loved his novel Open City and his essay collection, Known and Strange Things. 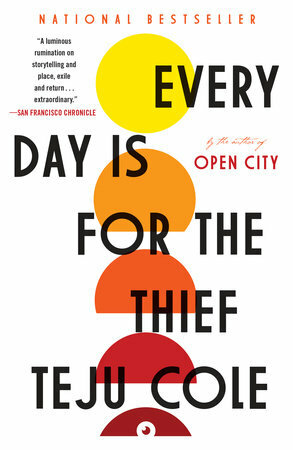 Everyday Is for the Thief was his first book. Haven't read it yet. I plan on getting to it after checking out his forthcoming photo-book/memoir/travelogue, Blind Spot. Can't wait to read this and see even more of Cole's unique photography.